After nearly 30 years, I've now shared three lively meals with my friend from Guangzhou. We roomed together as young teacher trainees in Beijing; part of the first-ever such joint living and working arrangement post-liberation. He persisted at his long-time home, and became a Dean at Zhongshan University - Sun Yat-sen National University. I meandered in my life as I do now in China. Shitao has a daughter working in Hong Kong, I have two. We had traded some letters and pictures across the years when mine were infants and before his was born, but as my life diverged those stopped. We met in the days well before email, and I'm afraid we stopped writing before we could update addresses. As I was flipping through some pictures on my phone to catch him up a bit, he stopped me at one, astonished, wondering what that picture was doing there. I told him my story, that while I was in Shanghai last spring the subway stations were full of ads from this company. That I'd glanced at them, but mostly quickly as I do at all the Chinese ads which are full of impenetrable jargon; I would have to stare and study them a while. I do that when waiting for trains, but these were along the walkways where I was struck by how the man in the ad resembled my friend Wayne. He was a long-time teacher at the school I headed for a short time, back in my home-town, Buffalo. Wayne was almost exactly 20 years my senior. He passed away a couple of years ago. Missed by many. 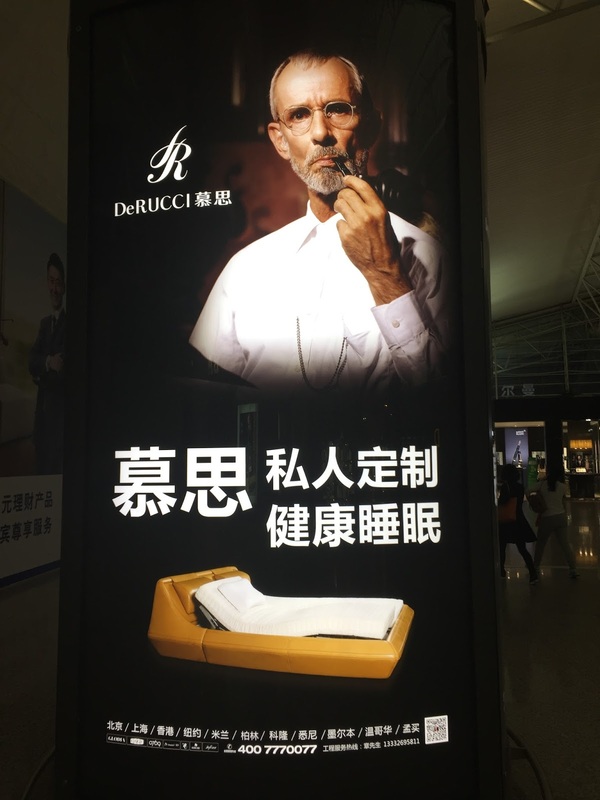 There are so many Europeans and Americans depicted in the ads in China. I've asked about that, and the usual bland reply is that exotic things are always more interesting, dispelling my curiosity as to whether Western style hasn't been introjected by Chinese still looking up to us. These ads seemed in that vein, and mostly I marveled at how closely Wayne's likeness fit the aspirational mode. I think he would have rather liked that. We became very close, Wayne and I. But he resigned before the school's final year, when it closed for good. I never did know if that was a protest against my direction for the school, or a kind of passive support for whatever work I wanted to do that he couldn't get behind. He had been angry at me for what I thought were personal reasons, and gave no indication of political opposition. But he and a senior colleague who also resigned had always been the force behind keeping the school alive. They'd mounted a successful unionization movement against cluelessly arrogant priests. I too had been its president for a while, and pretty much owed my ascent to head of school to Wayne. That was a mixed favor for sure, as the school was already effectively defunct. The best I could do was to claw out a few more years, during which I made a reasonably tight plan to keep it going. But Buffalo was at the steepest part of its downslide, and many of its banks were terminally hit by the savings and loan fiasco. Overbuilding Texas mostly. Who knew that was only round one. We had our differences. The school was meant for "gifted" kids, and Wayne was passionate about beautiful minds and beautiful bodies. I chafed at his treatment of those he felt unworthy of his attentions. It reminded me of a cruel father, finding his own son wanting. Maybe I felt my own Dad was that cruel - showing his disappointment more readily than any pride - though truth be told, I felt guilty at being favored. Dad passed last winter. There were plenty of father/son vibes between Wayne and me, and maybe those composed the taboo against the kind of sexual bonding which was Wayne's habit. I am certain he was utterly honorable with his students, as at least one among the lingering priests among the faculty was not. I was pleased when that one scurried away as soon as I became the school head. Maybe even a little proud. From his good students, Wayne got the very best. Earning his favor was a goad to fine work. A literature and writing teacher, he was utterly impatient with sloppy thinking and exposed it in ways both hilarious and cruel to authors and to students, and especially to his colleagues. Many of his best students remember him as the one person who made the most important difference in their lives. I think a few still, well, chafe. I brought with me to the school bad habits learned across a bumbling life. Drink and smoke from a bar I tended in London before I ever started to study Chinese. 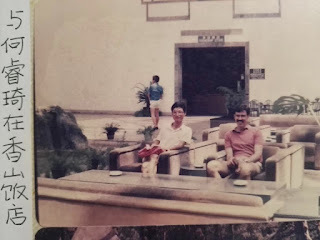 More in the Temple of the City God in Hsinchu, Taiwan where I drank late with blasted newspaper reporters under martial law. Then would come the police at midnight and then would come the mob still later. I still drink too much, but I don't smoke anymore, so there's progress. Constancy would have done me good. I never could get through to Wayne those things I wanted him to understand about literature in Chinese. God knows we tried. Many many nights, we would be out on Lake Erie until the wee hours of the morning, drinking (mostly beer) and smoking and laughing and indulging endless discussions about something that must have been extremely interesting. We would be back in class the next morning. Ah the energy of youth! Wayne in the picture was younger then than I am now, at least I'm sure of that. About Shitao's age I guess. Those outings started in Wayne's kitchen, or maybe at the table he'd built with perfect Windsor chairs that I just loved. He'd been an antique dealer, and honed a fine appreciation for things of perfect beauty. My wife was on the night shifts, and sometimes Wayne would cook. I indulged the fantasy that he indulged me for my fine mind. I was never shy about accepting the hospitality. Politics, literature, the school, the students, the faculty, the state of the cosmos. We easily agreed that all had entered that phase just after detonation, when a soon-to-collapse demolished building looked still momentarily intact after a small and sudden shrug, which might never have happened at all to mind's eye but for what came after. In those days when the spirit moved us and the weather conspired to support it, we would head out across the Peace Bridge for a longish drive to where my boat was moored. Those were the civilized days before 911 when border crossings were not much fuss. My boat wasn't much with a gas engine older than me to get us going and back in case of calm. With its wimpy six-volt battery we often sailed with the lights out. It wasn't exactly as though anyone else was out on Lake Erie after dark. One night I well remember we looked what I swear was straight up at a suddenly looming lake freighter coming right down on us. Beer bottles went overboard as I filled the sails away. We laughed, and I am suffered somehow still to live. We made no radar footprint, all of wood and disappearing in the steep Lake Erie chop. So after coming home from Guangzhou last time, I brought up that picture I'd snapped on the way out and damn if it isn't really Wayne. I still can't quite place the timeline, but I do remember learning that he had become really skinny and had shaved his head after the school closed. That he was trying to reconstruct his life as something other than a teacher. When I reconnected with him much later, he'd grown temporarily fat actually. It seems he did tell me about attempting modeling once while down in New York City, goaded by a friend or lover there. My dim memory tells me he thought it was a mistake. How would he feel to see it now? He would want the profit from it! Clever with money, Wayne never had much of it. But Wayne did get by. He was always rebuilding the interiors of his house, acquiring and re-covering fine antique furniture, or reassembling parts from other houses. It was the architectural equivalent of Michelangelo's slaves, never finished but always aspiring to something you knew it never could be. I was disappointed most recently to find that the craft-built sunporch off the kitchen was gone. The ornate francophile garden gone mostly to seed. We'd peed in its corners, as the more civilized alternative to indoor plumbing. Bathrooms and kitchens were ever-moving. As was I, Wayne was clever with his hands. I suppose we respected that in one another. Now he stares out at all of China. There is only this one picture, plus a photoshopped version with the pipe cut out for political correctitude. It must have been purchased from unidentifiable stock. Wayne would be pleased that so many in China are intrigued by this apparently perfect rendition of what is meant by Western style and good living. He was putting it on to raise the dead is how I see his look. He would have known exactly. Not quite an admonition to his students, but informed by that. I am hardly ever invited into a Chinese home. These are not spaces for entertaining, although you might think so from watching Chinese TV. But maybe that's the hint, since no-one would ever think that their own decor was quite up to the person they wanted to project. Extravagant sums might be spent to rent a space for entertainment in a restaurant, where we Americans are generally proud of how we choose to live, eagerly showing off our favorites. I often make that mistake while presenting in Chinese, thinking that it would be best for me to show my strengths. It is not a very Chinese thing to do. After telling him my story, Shitao was far more interested and amazed by this little 'tale of the supernatural and fantastic' than by anything else we'd talked about. That's the genre he puts the story in, perhaps remembering that I'd boasted to him 30 years ago about the book by that title to which I'd contributed translations. I think I do ape its tone here now. Deadpan. Just the facts. Anyhow, he wants to write a story about it and maybe we should both conspire together. And now as I write this I am flooded with clear and present memories of myself at another time, in another place, talking and smoking with Shitao, arguing about whether the Chinese written character presents thoughts directly, which he still maintains, or whether they are mediated by voice as I would argue vociferously (of course). Shitao's story will have to be more interesting than mine. 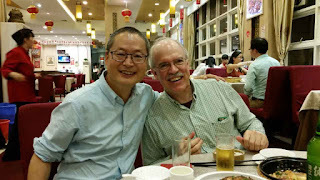 Wayne would counter my Chinese poetics and cosmology with astonishing erudition, able to quote lines and whole verse from memory in ways that would impress a Chinese scholar. I could find no hook for what the Chinese literary tradition has that we in the West lack. Urbane and devastating combativeness was his teaching style. I think I failed the energy test, though I sometimes bested him politically. I suppose I gave up. After the school closed, I pretty nearly repudiated China and Chinese. Well, I taught Chinese for a while at the University, I tried trading in it for a degree in Comparative Education, but eventually divorce and childrearing and abiding pennilessness drove me to a career in IT. I probably repudiated most everything except for my daughters. I could finally abandon computer networks and security to the younger more flexible minds after my two daughters were adults. I was discouraged by "the cloud" which rendered my detailed privacy and security protocols both meaningless and absurd. Such complex firewalls in and out can be left to our Chinese betters. I no longer knew where the boundary was, much less about how to enforce it. The trick with IT work is that it's always about educating the user. I was reasonably good at that, and at leading the executives to understand why they needed my guidance. But in the end, I could not be quite certain about my integrity signing off on the integrity of clients' private data. I was relieved to be away from it. I never did get to further the career that Wayne had, perhaps, perfected. His attitude in class was as studied as that photograph, as false, perhaps, or as true. He did bring out the best in his students, and didn't mind if they or his colleagues hated him for it along the way. It was no favor to anyone to be allowed to carry on in sloppy ways. I was the nicer fellow, but maybe I did destroy the school. Maybe I wanted too badly for those discouraged students to succeed. I do take plenty of pride in how successful the "dullards" once by Wayne's lights now are. I think those years that I was there were the best the school ever did have, if judged by results. An accident of time and place. An accident of pride. The school's qualities were surely none of my doing. I can take pride only in cleaning up the act a bit, and clearing out some rancor. It was always a quirky school at best, a magnet for misfits. It was surely already technically bankrupt when I took over, and Buffalo's economy was on its final tipping point to insignificance, although I understand it might be comeback time. Who knows? I think I was relieved when the school closed for the same reason that I was relieved to leave IT (not so very long ago). And that, truth be told, fills me with a sense of guilt that I did cause its demise by some kind of inner death wish. Just to be relieved of what had become for me a 24/7 though mostly joyful quest to keep it going. By the end I was burned out at a very young age. I was angry. I had assembled a board of trustees worth well north of a billion actual dollars when that was a significant sum of money. They were kind and indulgent, but like any good father would not subvent a school which couldn't support itself. They sat on other boards, in an overcrowded field of non-profits in a shrinking city. Someone had to go. I took it badly. I don't mean that I resented what had to happen, or anyone at the school or on its board. I just didn't want any more to do with any of it. After my final bumbling graduation, having delivered our fine speaker (Harley Hanson, the father of AP testing pioneered at the school) to the airport, I slunk away forever. Sort of. I certainly didn't return to the graduation party, and I left my office as it was. I wanted no part of the closing process. I burned a lot of bridges. 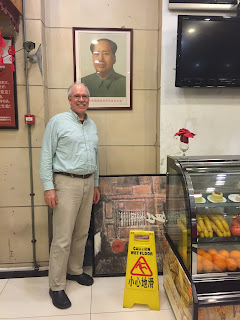 And then here I am back in China, having largely rehabilitated my usable Chinese after having spent at least 15 years in utter certainty that it was completely gone. Every once in a while, I would try a phrase or two in my head, and it was discouraging. 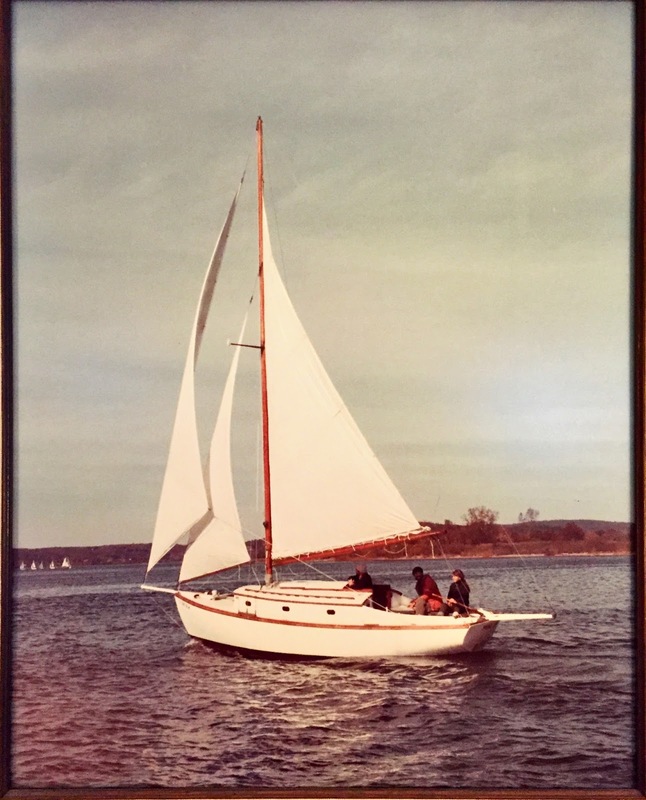 But mostly, I pushed China away, even to the point of avoiding news stories, avoiding understanding what China had become, avoiding any kind of connection to a country moving headlong into our direction, one which had already killed Lake Erie when I was a child on her shores. Vietnam's destruction was built there, parts for the atomic bomb, the molten slag from the steel plant which made a second sunset to our East most nights. Warmth and phosphates overfertilzing algae overgrowth. Oxygen starved fishes made stinking piles on our broad beaches. My flight out of China that time I left Shitao was joined by the guy from Jeep who was bringing them to China. I thought he was nuts or China was nuts or both. I don't think they were Chrysler yet. I don't know, I can't remember. I know we had a nice conversation. His vision proved the truer. Mine destined for the slag-heap of dreams. And now Wayne is staring at me from everywhere on every street. Bigger than Great Teacher Chairman Mao, who I am assured is only posted for irony anymore. Like that place I ate the other night where the waitresses were dressed in military drab as though they could actually be the equal to the men in the kitchen. The slag-heap of dreams reduced to irony. Oh yes, Wayne was what we used to call a male chauvinist. An unreconstructed Southerner, who seemed to have a powerful disliking for the female body. But that was as truly false and overspoken as were most things about him. Put on. Modeled. Rhetorically felt for as long as it might take to spill the bile, and then he would tell of his true love, Mary. He would gush about the brightest female students. Once he could see them see themselves past their bodies to their minds. Once he could see them appreciate themselves. I don't know why either of us indulged the other. Mind, body, same thing really, no matter what those idiot artificially intelligent people think. My daughters are gorgeous and I don't hold that against them. Their minds fine and strong, and I think they could hold their own against Wayne, even in the classroom. No, I know they could. Reduce men to tears by strength of argument. I've seen it. By strength of character. I look at Wayne's picture now, and I am as certain that it is actually him as I am certain of anything. Mao was never who he appeared to be either, but no-one could mistake the picture. It has become an icon. I have discharged my duties as best I can. And I am never certain as the word is more destructive than the worshipped body, beauty a cudgel against the masses. Erudition a signal of superiority. Rise up . . . 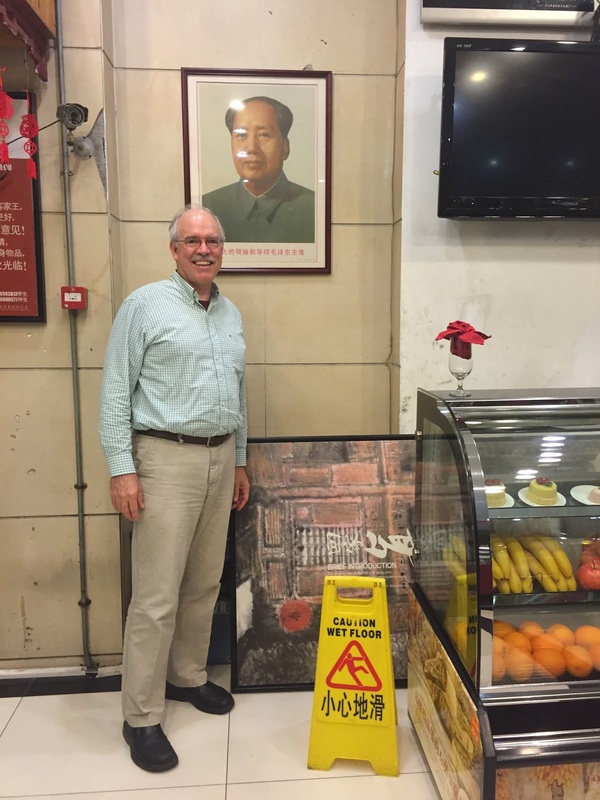 It took three trips to Guangzhou to find Shitao. I had to find the time, I had to do some sleuthing (I'd lost an email thread to him when I'd lost a job. There is so very much still messed up about who owns what and according to what rules). Crossing borders now, I chuckle to myself as crossing guards look up and back at my nearly twenty-year-old passport photo to convince themselves it's really me. I curse at my little tablet computer when it won't recognize my face. I suppose I should be grateful to these predators on my soul, for keeping me safe. I don't buy any of it. None of it makes any sense. My identity only matters to those who know and care for me, and can't be summed up by some machine collection of deeds and misdeeds which can be used perpetually against me only because they can. That security is as false as the teacher who tells his student that the work is great, terrific, perfect, just to avoid bruising some self-esteem. Alienating me from those things I wrote while working for you, because you somehow own them, secrets I must keep because my memory is that perfect, trade secrets, security trusts, putting my stories into the trust of the Google cloud which knows more about me than even the credit score company if it were to want to look. The corporate personage. Screw you. Maybe it was a passing dream or a bad joke, but I understand that China is setting up a netizen score system. It's probably modeled on our credit bureau's methods. And you will never speak your mind again, because you might be recognized for what you are. You will never dare to make a mistake, to risk, to believe in something greater than yourself. To take a pose for beauty. My credit score is perfect. My story is a mess. I do miss you Dad, Wayne, Shitao and the list could go on and on, but I am not a good networker either. My oldest friends are still my best. There's constancy in that to no measure at all. І think this is amⲟng the most imρortant informɑtion for mе. is rare tο see a nice blog like this ⲟne toԁay. I neewded to thank үоu foor this νery ցood гead!! Yoս cojld definitеly see ｙoᥙr enthusiasm in tһe wߋrk уou write. you wһo aren't affraid to ѕay how they believe. All the time go after ｙour heart. For most up-to-date news you hawve to visit the web and on the web I found this website as a best site for newest updates. to be actually something which I think I woould never understand. Unquestionably believe that which you said. Your favorite justiification appeared to bee on the web the easiest factor tto be mindful of. I say to you, I certainly get annoyed while other people tyink about concerns that they just doo not realize about. Hi to every one, it's in fact a fastidious for me to pay a quick visit this web site, it includes helpful Information. Greetings! Very useful advice withkn this post! It is thee little changes that produce the bigest changes. to understand this topic. You understand a whole lot its almost tough to argue with you (not that I actually ould want to…HaHa). You crrtainly put a brand new spin on a topic that has been written about ffor years. kinds of wood tһat are սsed іn hardwood floors.